Much has been written and many debates take place about how to rate wine. It seems now that the 100 point scale is seen as "old guard," that it has not been effective at communicating a wine's quality. There are of course other rating systems, and their effectiveness is also debatable. I don't want to spend time here summarizing the various arguments, and I don't have a definitive opinion on the best rating system for wine. But I do have some thoughts that I want to share. I think that some wines are better than others. That might sound silly to say, but there are folks who think that endeavors in the world of art and craft cannot and should not be measured in an absolute sense. They point out that one person's Mozart is another's Black Sabbath, and that both are equally excellent to the individual beholder. And it is true that we each have our own preferences regarding things like paintings, film, music, wine, roast chicken, and so on. It's romantic to say that "the perfect wine is the one you drink with your lover at sunset in a cafe overlooking the ocean." But there is a difference between personal preference and objective quality, and this is the whole point of professional criticism. The critic is supposed to be able to put their personal preferences and experiences aside and evaluate based on a set of established criteria, and then tell the rest of us something definitive about objective quality. What I'm saying here is that DRC is better than Yellowtail. It is higher quality wine. There may be people who prefer the smell and taste of Yellowtail, or who cannot distinguish between then two, and those people are welcome to their preferences and should go forth in peace and be happy. But one is a better wine than the other, regardless of personal opinion or the cafe at sunset context. If you agree that there is objective quality to wine, then you probably agree that there must be some way for a critic to measure a wine's quality and communicate this to the rest of us. This is the hard part. Some things are easy to rate - things that can be expressed finitely in purely mathematical terms. If I wanted to know which brand is the best AA battery available on the market, I could find out the average number of minutes each one lasts, determine the average price of each brand, and create a statistic that tells me how many minutes-per-dollar-spent I can expect from each battery. Rarely is it this simple, however, even when things can be expressed purely in mathematical terms. Think about rating cars or schools or baseball hitters. How do we know which hitter is the best? Batting average is a start - some are higher than others, and there is a highest each year. But is the person with the highest batting average the best hitter? Is someone who hits 10 singles in 20 trips to the plate a better hitter than someone who hits 8 doubles in 20 trips to the plate? What about someone who hit only 5 singles in 20 trips to the plate, but those singles came at crucial points in the game and scored runs for the team. It is possible to determine which hitter has the highest batting average or hit for the most total bases in a season, but determining which is the best hitter requires more than statistics. Painting, film, cooking, making music, wine...those things don't easily lend themselves to measurement in mathematical terms. But we have inherited a system of wine criticism that attempts to impose a mathematical framework on wine evaluation. The 100 point scale requires us to accept the idea that it is possible to measure something about wine, to assign a numeric value to one or more of its traits and arrive at a finite conclusion. That there is an objective qualitative difference between a 93 and a 92 point wine. Perhaps there is, but I'd like to see the rubric used to arrive at such a conclusion - how are those points generated? To me, it makes sense not to try to impose finite mathematical rating systems when the subject matter does not itself generate outputs that can be measured using numbers. Why not relieve ourselves of the burden of ordering wines in such tiny groups (87 points, 88 points, 89 points, etc.) and instead work within larger groups, accepting that there are no exact measurements for wine quality. I would prefer a system in which the professional wine critic tells me which wines are of the highest quality, which are of high quality, which are above average, and so on, without attempting to distinguish between wines within each group. 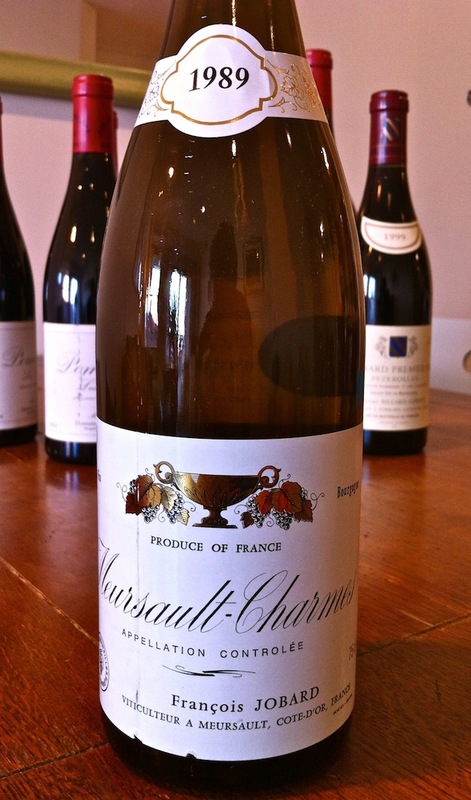 Which are the highest quality wines of Meursault? 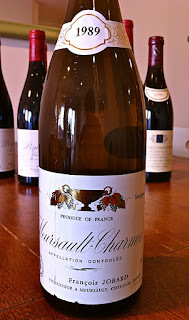 For me, it would be enough to read a critic who tells me (and I'm making this up) that Coche-Dury, Comte Lafon, Pierre Morey, and Roulot make the highest quality wines of Meursault; François Jobard, Pierre Matrot, Pierre Yves Colin-Morey make high quality wines, and so on. I also would like to read about which wines by Comte Lafon, for example, are the best. And I'm frustrated with the fact that Perrières gets 94 points, Charmes and Genevrières get 91-93 points, Gouttes d'Or gets 90-92 points, and Clos de la Barre gets 89-91 points. From that I understand that the critic rates the wines generally in that order (and every year, they all do), but I still don't understand the value of one point. 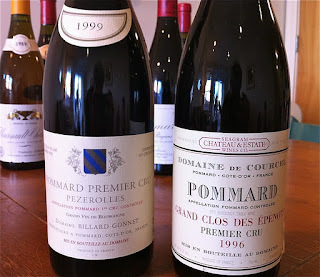 Perrières is 94 points and Charmes is 93 points, so Perrières is one point better. But what generated that extra point? I accept the idea that Perrières might objectively be a better wine, but not the idea that the critic who awards the additional point experienced something in drinking the wine that can be measured and expressed by a 94 as opposed to a 93. My guess is that Perrières, Charmes, and Genevrières are all highest quality wines. Perhaps we don't need to take it any further than that - they are all highest quality. There may in fact be some objective truth - one of them might be better than the others in a certain vintage, but it seems to me that the sensations the drinker experiences in coming to this conclusion are not quantifiable. * One star denotes a wine of particular quality and distinctiveness of character, one that stands out among its peers in some significant way. ** Two stars means that this wine is outstanding in its class, showing a marked quality, expression and refinement of character. *** Three stars indicates a champagne of the highest class, demonstrating a completeness and expression of character that places it among the very finest wines within its context. Needless to say, these wines are uncommon. This sort of system puts wines in large groups and requires me to do some thinking on my own, and I like that. Really he's just telling me the groups of wines that he thinks are best - which are very good, which are good, and which are not as good - the rest is up to me. There are over 1,000 wines reviewed on Peter's site, and 61 of them are awarded three stars. I'm sure Peter could tell me his favorites among those 61, but would laugh at the idea that there is one "best" wine within this three star group, that it is possible to construct a strict ordering of those 61 wines. That said, he could explain what it is about each of those 61 wines that merits it being in the three star group, and why each of the 251 two star wines is not in the three star group. I understand that my analysis here is incomplete, and I'm not trying to start an argument. I guess I'm just saying that in trying to impose a strict mathematical ordering on wine evaluation, we are barking up the wrong tree. If you have something thoughtful to say about this, I'd love to hear it. But spare us from rants about points and the evil culture of selling wine, and also from salt of the earth declarations about how beautiful the simplest country wine can be with fish just-plucked-from-the-sea. I'm starting with the notion that some wines are objectively better than others, and that there must be some way of measuring this. Just not the 100 point scale we've been using. How can this objective quality best be measured? And how should this measurement be communicated? On new year's eve a good friend took pity on me, alone in the house with my very young and very wonderful daughters, and he decided to come over to hang out and have dinner. 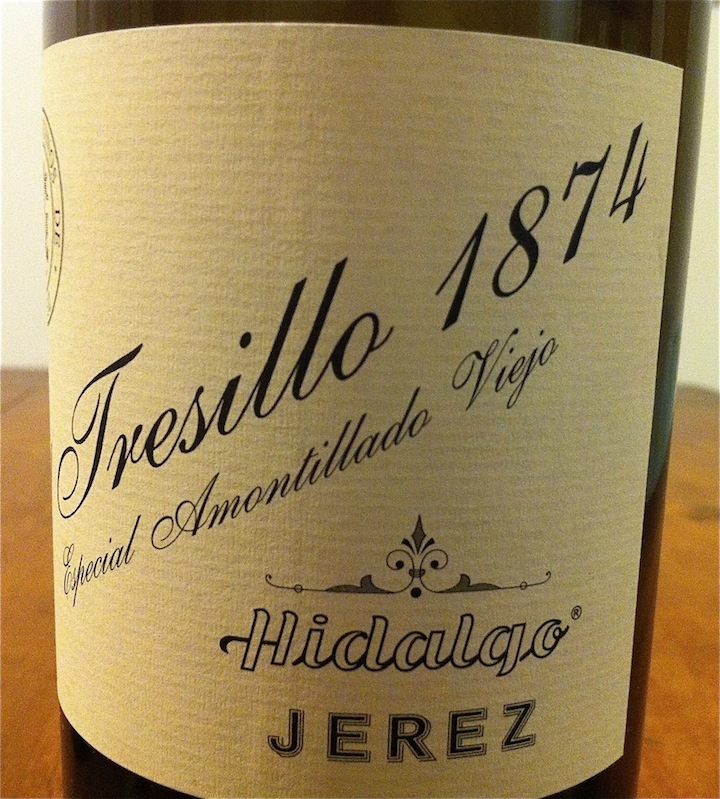 We of course opened some special wines on that night, one of which was a bottle I brought back from Jerez in October, Emilio Hidalgo Especial Amontillado Viejo El Tresillo 1874. I was very excited to drink and share this wine. The solera began in 1874 when the Hidalgo family purchased the bodega and the wines in the bottle are an average of about 50 years old. This is special wine - very little is bottled every year and it is not imported to the US. When I visited the bodega in October they were generous enough to open a bottle for us to try, and the wine was amazing. I bought one to carry home in my suitcase. So, on new year's eve at some point, I went to the back room where my wine fridge sits and retrieved this bottle and proudly strutted into the kitchen where my friend stood and showed it to him. "We're going to drink this now," I said. And I told him about the wine and how good it would be and he was impressed, or at least acted like he was impressed. 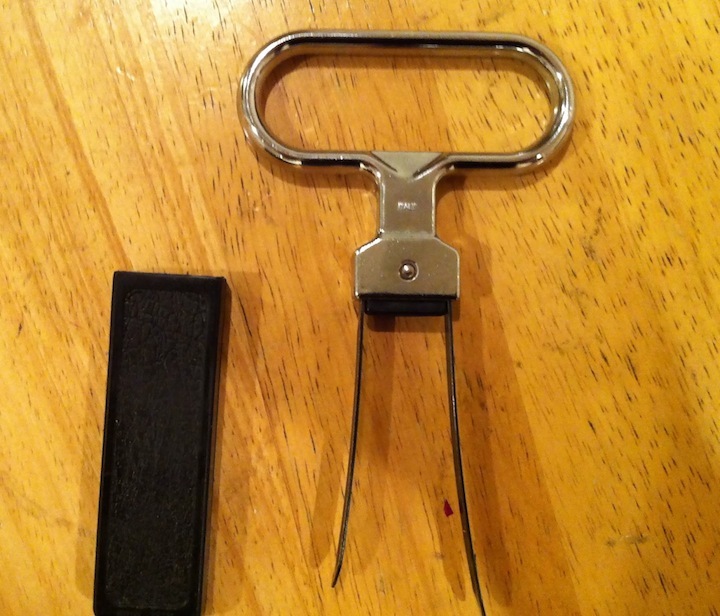 It is clear from the photo that the wine is in a vise-like grip, and would be mute for days. The problem is, the wine was absolutely and completely mute. It smelled and tasted like almost nothing. Nothing. Sure, it didn't matter because we had a great time together and it was new year's and it's just a bottle of wine, and so on. But of course it matters. It matters to me. I drank this wine and I know how good it is. Why not on this night? It wasn't flawed in any way, just very, very quiet. We both drank a glass, I re-corked it, stuck it back in the wine fridge, and we moved on to other things. 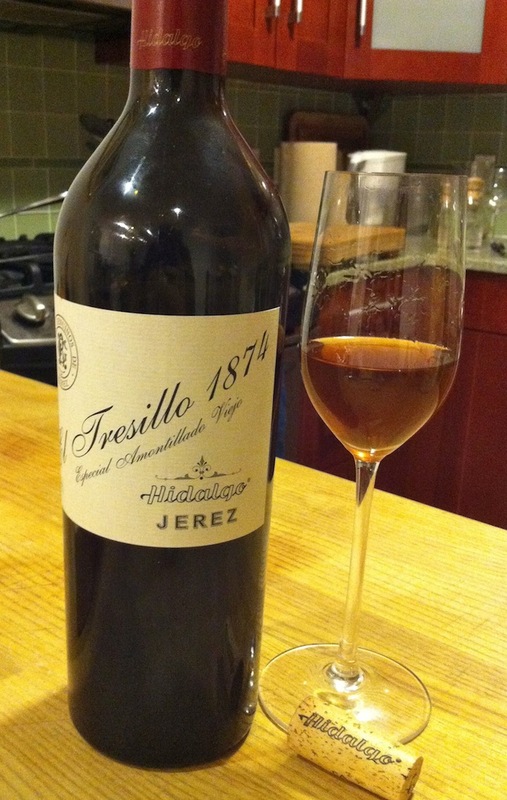 Peter Liem has told me on many occasions that brown Sherries - Amontillados, Palo Cortados, and Olorosos, when well made, tend to show better at least a day or so after being opened. Why, it's hard to say. It's not like a young red wine, where exposure to oxygen approximates the aging process and the wine shows a more complete version of itself. 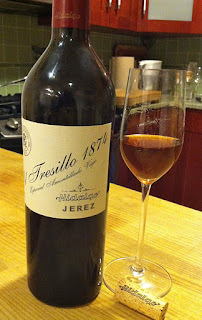 The wines in this Amontillado are already quite old. Perhaps we can think of it the way we think of other very old wines - they sometimes do better when we open them hours in advance of drinking and let them air out a bit. Whatever the reason, well made old brown Sherries do not degenerate over several days after opening, quite the opposite - they improve. Clearly the wine is improving here, but as evidenced by the photo, it is still constricted. Day 2 - Now there is flor character on the nose - caramel and butter. The aromas are brighter and the flavors more vibrant in the mouth, but the wine is still not terribly compelling right now, somewhat uni-dimensional and not showing much complexity, or much of anything. Day 3 - Did not taste. Whaddaya want from me? I had other things going on. One can see here, by day 4, how the wine has reached its apex of aroma and flavor. Day 4 - Whoa, what a difference. The nose is walnut skins - yes, the skins - there is that level of detail all of the sudden. There is still a creamy flor-influenced base note. The nose is still a bit constricted maybe, but the palate has expanded and improved dramatically. There are bright and vibrant flavors of lemon peel, caramel, and hazelnut, very complex , and the wine changes through the midpalate and is very energetic, the finish is orange and coffee and goes on and on. This is the great wine that I remember. Day 5 - The best of the lot. The nose is regal in its complexity and subtlety, with coffee grounds and nuts, definite flor character, and it is moving in its penetrating focus and its elegance and finesse. The palate achieves complete harmony of flavor, striking complexity, and a mouth watering and long finish whose perfume I could access two hours later as I was getting ready for bed. Truly a beautiful wine. Day 6 - The nose is still lovely, but there are some oxidative notes that appear too, and here and there I am aware of the alcohol. The palate is just as great as it was in the past two days, even longer maybe, but again with the slightly oxidative note of dried prune. If I had tasted this win only on this day I would think it great, but the memory of days 4 and 5 are even better. So what does this prove? Absolutely nothing. But it's interesting I think, and probably representative of what you will get when you open a bottle of very fine brown Sherry. it might be worth opening it and pouring a small glass, and then leaving it for a few days until you are ready to share it with friends. The wine will improve. Even if it starts out well, it will get better. I was given an amazing birthday gift in November, an old bottle of wine by Produttori del Barbaresco, the 1959 Riserva. This is very exciting - how often does one get to drink a bottle that old? In my case, not very often. I've had a few old wines, but with the exception of a few cases, I haven't opened them myself. A more experienced friend or a sommelier typically has handled that part. How do you open an old bottle of wine? 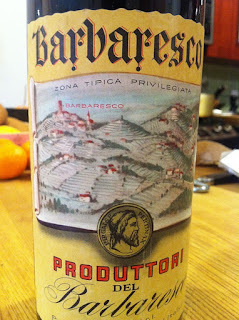 I knew that I wanted to drink the '59 Barbaresco over the holidays with friends. I asked Jamie Wolff, partner at Chambers Street Wines, what to do with the bottle (which was purchased at his shoppe). He told me to stand it up a week in advance, not to move it at all during that time if I could help it, as it would probably have a lot of sediment. "But my wine fridge won't accommodate a standing bottle," I said. "How do I keep it at the proper temperature?" Jamie suggested finding the coolest spot in the house and standing it there. "And when you serve it," he said, "open it up four or five hours in advance and decant it carefully off the sediment." 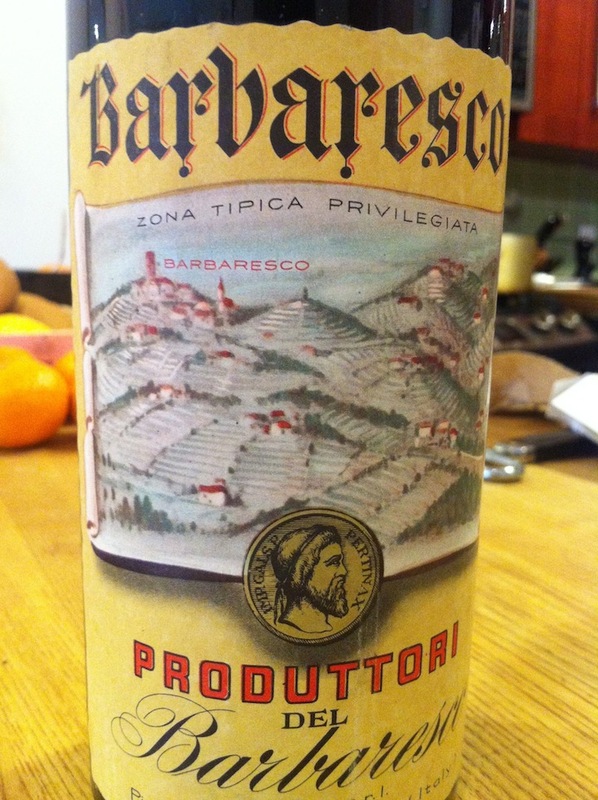 As the Barbaresco evening approached, I began to wonder if an old wine like this would die with four or five hours in the decanter, so I asked another friend about how to deal with it, and his answer was entirely different. 1. How do you prepare an old bottle for drinking? 2. How far in advance of serving do you open the bottle? 3. Do you decant or not, and why? 4. How do you open an old bottle when the cork might be likely to crumble or break? 5. What should we look for when the bottle is first open - how can we tell if the wine is good or not? 6. 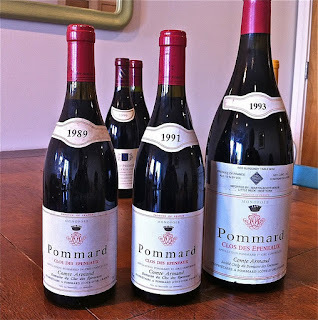 Any general thoughts on evaluating an old wine - for those of us who don't often drink old wine, it can be confusing. 7. Do your ideas about pairing wine with food change if the wine is old? 8. Any other advice most appreciated. Levi - Bottles should be left alone for as long as possible before opening. If you know in advance that you will be opening a bottle of wine a few days from now, I suggest standing it up vertically in the cellar to let the sediment fall to the bottom of the bottle. If you are storing the wine horizontally, I recommend not moving the bottle much while it is in storage. This usually becomes more of a problem with double deep bottle racking, where you have to move one bottle to get to another. Bottles can get moved a lot. I recommend putting the older wines in the back, so that they bottles that are getting jostled in the front are the younger wines. If you are removing a bottle from horizontal racking, I recommend either using a bottle cradle or I recommend holding the bottle near horizontal, keeping the bottle in the same way as it was in the rack. In other words, don't spin the bottle around as you move it. The aim is to keep the sediment in the same place without moving it around into the liquid. I also recommend taking an elevator, if available, rather then walking with a bottle up stairs. Joe - Stand it up in the morning if you’re drinking it at night. Let the sediment sink to the bottom. Peter - It depends on what it is. If it's an old red wine with sediment, you ideally want to stand it up for several days, sometimes even a week, before opening it, to allow the sediment to settle. It's not just an aesthetic issue—the sediment can be bitter, and its presence definitely changes the flavors of the wine. You can decant a wine that's stored on its side if you need to (in a restaurant setting, for example), but you have to be careful. (I'll always remember drinking a 1964 Bartolo Mascarello at Valentino in Santa Monica that was virtually opaque with sediment due to utterly incompetent wine service.) If it's an old white wine or champagne, you need to chill it, of course. I have no scientific basis for it, but for whatever reason, I don't like shocking an old wine in an ice bath or the freezer or whatnot. I prefer to bring it down to temperature slowly in the fridge, which takes time. Maybe it's just a question of respect. Levi - Some cowboys, especially in the Nebbiolo set, open bottles way far ahead. I generally don't. I like to see how the wine changes in the glass. Joe - It really depends on the bottle. A few years ago I had a 71 DRC Grands Echezeaux with questionable storage. It was popped and poured and it was glorious for fifteen minutes. After that, it faded hard. Someone at the table was smart enough to say that we should pop and pour. Otherwise, we would have missed out on it totally. Peter - This is a tricky question, and one with no right answers. I've seen old wines continue to develop for three days, and others that have crashed within 15 minutes. It's true that old wines need time to emerge (you'd be out of sorts too if you'd been trapped in a bottle for 50 years), but personally, I tend to err on the side of caution, not because I'm afraid that the wine will die, but because I like to experience the evolution of the wine from start to finish. For a grand old bottle, I prefer to open it, take a small glass, and decide from there what to do with it. Having said that, I tend to do this in the afternoon, if I'm serving old red wines at dinner. But then afterwards, I'm always the guy who has like 12 glasses in front of him at the end of a dinner party, because I've been saving all these wines to watch how they grow over the course of several hours. Levi - Old wines are candidates for decanting when they have thrown a good deal of sediment. But if you are dealing with a low tannin grape, I usually don't decant, even if they are throwing sediment. That is to say, I generally don't decant old Red Burgundy, I pour carefully from the bottle instead. Pouring into a decanter should be low, slow, and steady. This is not the "splash decant" that you might use for a younger wine. Do the decanting all in one go, with no fits, starts, or interruptions. Hopefully you won't sneeze during the operation. If you do stop and start the liquid will become muddy with sediment before it leaves the bottle. That being said, it is a great idea to "season" the decanter you intend to use with some of the wine in advance of pouring the rest in. Do this by pouring in a bit of the wine, swirling it around in the decanter, and then discarding. You can taste the discarded wine and test for TCA before pouring out the bottle as well. When you do decant the bottle, keep your light source behind the bottle neck, not behind the decanter lip. You want to stop pouring before the sediment leaves the bottle. Keep in mind that with sediment, there are many variations of the beast. Some are sludge like, some are flaky, some are like fine pebbles at the seashore. Each will move differently as you pour the bottle out. In practice, I usually do not double decant old bottles of wine. Some people do this however, especially if they are attending a BYOB dinner. They double decant the bottle in their home beforehand and then bring the decanted wine in the original bottle to the dinner. If you do want to double decant a bottle, I recommend using hot water to clean out the sediment in the bottle. This is because hot water, unlike cold water, evaporates. Thus you will have less water to drain out of the bottle later, before you add the original wine back into the bottle. It is worth keeping in mind that hot water will make the bottle's glass warm, and that you should wait until it cools down before adding the wine back in. Also, very old bottles of wine may have thinner glass than is common today. In which case you might be careful about extremely hot water and the possibility of cracking glass as well as fragile bottle lips. Say you don't decant the bottle of wine, but it has sediment on the bottle, what then? Well I recommend either pouring from a cradle, or holding the bottle by the bottom, with your fingers underneath. When you go around to the different glasses to pour, don't move the bottle up and down a lot. Try to keep the bottle neck at the same level. This is counter to what usually happens when pouring at a table, where the bottle gets raised back vertically a lot, and generally requires going slow and being careful. Sometimes it is easiest to pour all of the glasses away from the seated table, and then to hand the glasses out once poured. This eliminates moving the bottle between people at the table. If you are pouring from a cradle, which can be helpful, just remember that it is easy to bump someone with the cradle when you are pouring. Which defeats the purpose, really. Keep in mind that "The Hand That Rocks the Cradle" was a scary movie. Joe - There are no hard and fast rules, but typically I would only decant to avoid sentiment. Otherwise, I have a sense that decanting is too aggressive for many old wines and would prefer to just pull the cork and let them aerate slowly. If I tasted an old wine that felt particularly tight, I would decant. Peter - I decant less and less now. I almost think I decant more young wine than old wine nowadays, which is sort of ironic. But it depends. You decant for two reasons, right? It's to give the wine air and to take it off of its sediment. In the first case, as I said before, I prefer to watch the wine evolve slowly, so I don't really care. I'm patient. With regards to the second, it depends on the situation. If we're serving an old bottle in a restaurant to eight people, then yeah, it needs to be decanted. If it's just two of us drinking it at home, maybe, or maybe not. A friend and I have been thinking over the last few years that we like opening old bottles, say a 50-year-old Barolo, hours ahead of time but not decanting, just pouring a small glass at first to taste it, then letting it hang out all day until it's time to drink it. I feel that it preserves a silkier texture and better clarity of flavor than if you subject it to the oxidative shock of decanting. But that could just be my imagination. Corkscrew worms vary in length (photo courtesy of Levi). Levi - When you decide that you want to open up the bottle, you should do it on a flat, sturdy surface. Don't be a clown and try to open an old bottle of wine in the air. Not a good idea. You want to move the bottle as little as possible while opening it. One problem with this is that people in the room might want to see the label of the fantastically old wine and pick up the bottle from where you have it. That is a bad move. The less bottle movement the better, until the bottle is empty. Sunken corks, that is, corks that are not flush with the bottle lip, present a problem. It is hard to get the right leverage with your corkscrew on sunken corks. 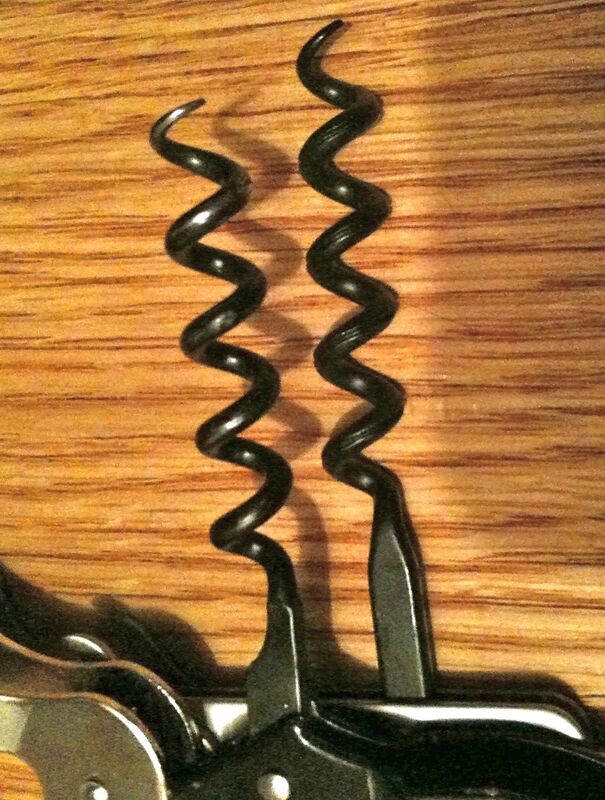 This is especially a problem for single pull corkscrews. It is very easy to chip the glass around the lip in this instance, and that can lead to safety concerns. It is best to use a double pull corkscrew, and start with lifting when the worm is halfway in, and then drive the worm in further when you have lifted the cork a bit. Another possibility is that a sunken cork might also slide right down the bottle neck when you start to press it with the corkscrew worm, which is usually a phenomenon that can accompany heat damage or oxidation. If the cork slides into the liquid, you can find yourself with a problem, because your first instinct may be to decant the wine, but the cork inside the liquid still covers the bottle neck at the bottom, and doesn't allow the liquid out steadily or at all. If this happens I recommend taking something long like a plastic straw and pushing the cork down with the straw while you decant. This will allow the wine out of the bottle. Try not to pierce the bottom of the cork as you are getting it out of the bottle. If you go through a cork all the way with your worm, your will have better leverage for removal, but piercing an old cork will throw a lot of cork dust into the liquid. Extracting cork fragments that are stuck flat on the bottleneck works better if you put tension on the corkscrew worm by holding it with two fingers against the bottle top as you turn the worm in. This also keeps the worm straight. 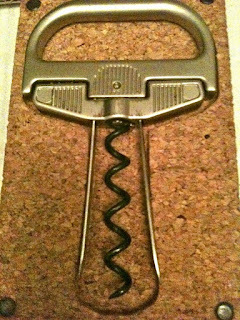 If instead you are dealing with a cork that has hollowed out in the middle, but stuck to the walls of the bottle neck as you tried to remove it, then you are going to have to angle your corkscrew and pin the cork that is against with glass with the corkscrew worm, then pull up. You might have to do this a couple of times to get all the cork fragments out. You might think that something else besides a corkscrew will help you get those last bits of cork out of the bottle neck. I don't recommend experimenting with anything, like an oyster fork, unless it has an extremely long handle. The Durand opener (photo courtesy of Levi). Bottle openers vary a lot. For very old bottles, the best thing you can do is purchase a combination Ah-So and corkscrew worm, such as The Durand, which is available for sale at www.thedurand.com. These things really are genius, and will save you all kinds of problems. Pieces of the Durand (photo courtesy of Levi). It is also possible to make your own such combination, using a standard Ah-so and a separate T-Bar corkscrew worm. 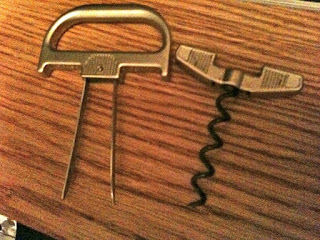 As far as stand alone corkscrews, I personally find that opening an older bottle is easier with a double pull corkscrew than a single pull. 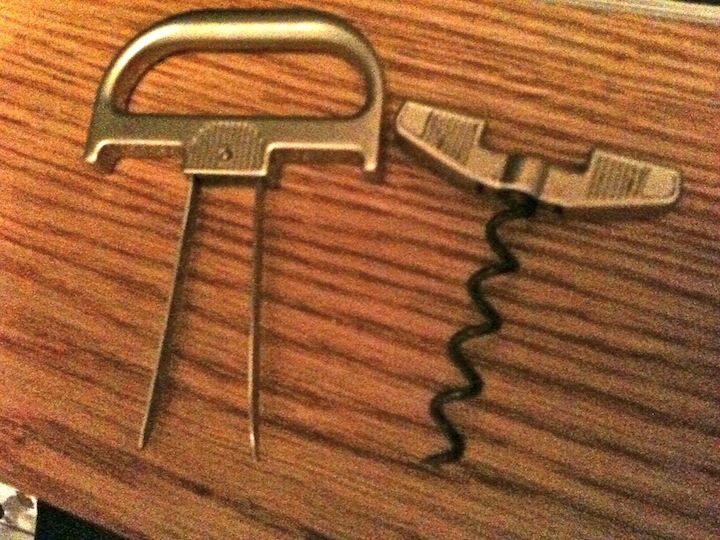 I usually use the Pulltaps corkscrew brand for double pulls. The problem with that is that the Pulltaps worm is not particularly long, and some old corks are. Also, the knife on a Pulltaps is pretty basic. You will often find a longer worm and a better knife, on a Laguiole or Chateau Laguiole. For this reason I try to keep a few different types of opener around, to help in different situations. 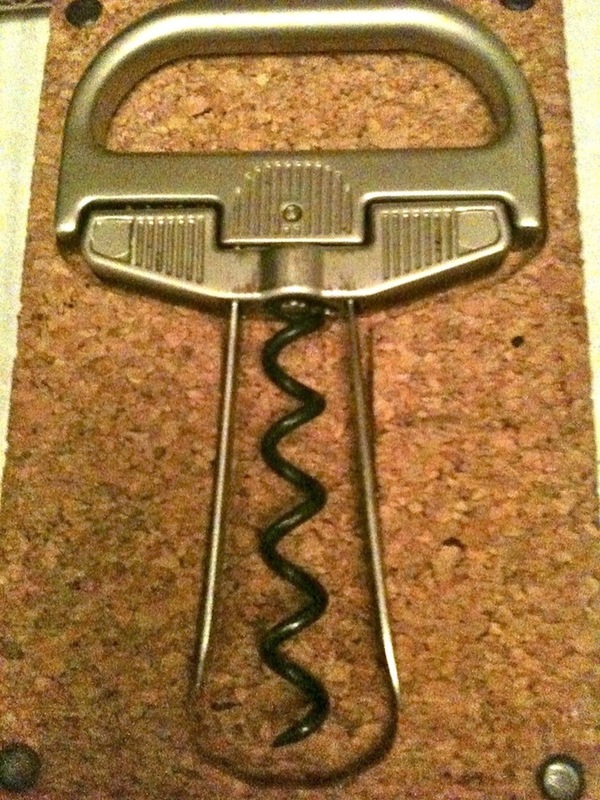 Whatever you purchase it is very important to get a corkscrew without any kind of coating (besides paint) on the worm. You want a metal worm. The other types destroy old corks in a fashion that is fantastically disheartening. Joe - Personally, I’ve had so many disasters with using a cork screw that I go straight for the Ah-So. Peter - High dexterity score is key. And an Ah-So. Last year, one of my friends bought this thing, which is awesome. Levi - How you handle the bottle can have a lot to do this. Murky, dull, and light colored red wine is a bad sign. But ultimately the test is the taste. Joe - Check out the color and smell, especially to see if it’s maderized. Also, a lot of turbidity is usually a bad sign. 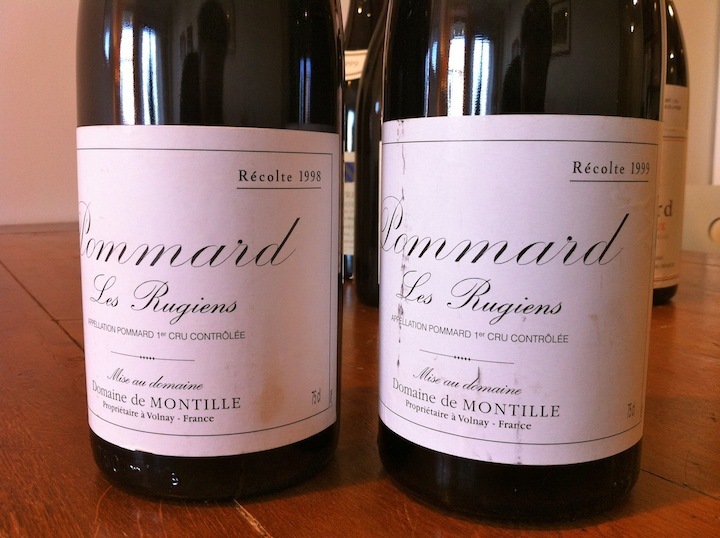 Often wines will seem older when first poured and then will liven up. Wines, especially red Burgundy, can change color in the glass. Sometimes they can look more faded, but an old wine can actually becoming more youthful in appearance in the glass. They brighten up and darken. Peter - Old wines are funny things—they don't necessarily reveal themselves right away. Sometimes with a very old wine it's even difficult to tell whether or not the wine is corked, as it can be musty and weird at first but then develop into something amazing later. You're looking first for flaws (i.e. TCA) and then for oxidation, but on the subject of the latter, it often pays to be patient. Many old wines actually feel fresher and more primary in flavor after 15 or 30 minutes than they do when they're first opened. Levi - The condition of a cork can tell you a lot about storage. First of all, once you get a cork out, it is worth checking to make sure what it says matches what the label of the bottle says. If not, that can mean that you a forgery on your hands. More generally, if the cork has a muffin top and flares out above the bottle lip, that can indicate that this wine has seen poor storage. Similarly if there is a visible line of dried wine stain down the cork length. Often enough, an very old cork will be completely soaked with wine stains, so this isn't a terrible, terrible thing, but neither is it desirable. On the other hand, a too perfect, pristine cork in a very old bottle often raises about possible recorking that might have taken place with this bottle. It is worth considering if the bottle is a recent release (however old the wine's vintage may be) from the winery, as the corks should then look pretty great. Joe - Basics like looking at the fill and looking for seepage and things like the cork pushing up or receding are usually very helpful. Clumps of caked on sentiment in one area of the bottle can be a bad sign (but this isn’t always the case.) Also, look at the color in the light to see if whites look oxidized or reds look turbid and brownish. It really depends on the wine: Auslesen and old sweet Chenin Blanc can appear really dark and be perfectly fine, for instance. Peter - There should have been a reason for aging it. Is it better in some way than a young version of that wine would be? Ideally, an old wine would have developed an inimitable complexity and character while fusing its components together into a more seamless harmony—the disparate parts of a young wine are now integrated into a complete whole. But just because it's old doesn't necessarily mean that it's better. Old wines can be mediocre too. And everybody has a different sort of threshold as far as maturity goes. I like mature flavors, and I tend to prefer my wines a little older than most people do. A wine should definitely retain vibrancy and energy—it shouldn't be dead or overly oxidized. But I don't always care about things like primary fruit. You drink old wine because you can't get the same experiences that you do in young wine, and drinking a grand wine in maturity is one of life's greatest pleasures. Levi - The adage is true: simple food is better with old wines. Steak. Squab. Mushrooms. Risotto. They are all on my old wine team. Joe - The hope is that aging wines results in them stretching out, having integrated flavors and becoming more nuanced and complex. I want the wine to shine and take center stage without much interference. I like to keep things simple with straight forward, uncomplicated dishes. There’s nothing wrong with a perfectly roasted chicken (or guinea hen), leg of lamb, or fish. 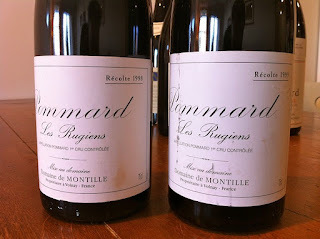 I try to avoid overly pungent and bright flavors that have the potential to cripple to the mature fruit on an old wine. Peter - I generally think that the older the wine is, the simpler your food ought to be. I don't necessarily believe that the best setting for a great mature wine is a Michelin three-star restaurant. My favorite way to experience an old bottle is to drink it at home, making some food that complements it but that doesn't compete with its complexity. Levi - Keep in mind that the kind of capsules you find on older bottles, say of Bordeaux before 1990, had lead in them. They are firm, often stick closely to the bottle neck, and tend to come off in long strips if you unwind them from a cut in the side of one. These kinds of capsules tend to leave a nasty cut on the finger if you aren't careful with their removal. You can always tell a sommelier who deals with a lot of older Bordeaux: they will have a bunch of small cuts on their index finger. It can be helpful to angle your corkscrew knife about 45 degrees into the groove underneath the top part of the capsule, cutting upwards. This will result in a clean line cut into the capsule, and also encourage the top part of the capsule to flair out at the cut edge, allowing for easier removal. When lead capsules are involved, I think that it becomes especially important to wipe with a wet, clean cloth the bottle top after the capsule has been removed (and before the cork is extracted). This prevents small particles of lead from getting into the liquid later as you pour. 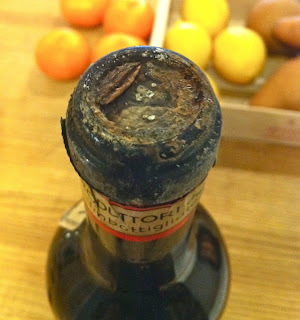 Older bottles may often have a bit of fungal growth under the capsule anyway, which should be removed in the same way, with a wet cloth. If instead of a lead capsule you encounter a wax capsule, I recommend placing a napkin underneath the bottle before you open it. That way, the small bits of wax will fall onto the napkin instead of your table surface, and you can collect them all easily at the end of the process by gathering the napkin up. 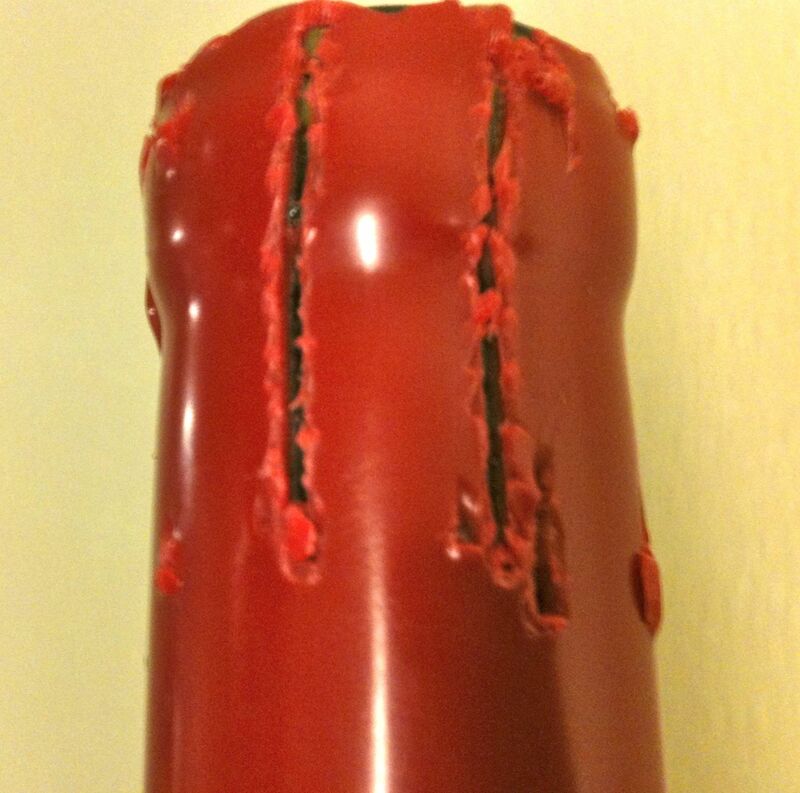 Some people scrap or bang away wax from the top of a bottle before opening. I think that in the case of older bottles, this only encourages the kind of vibration that moves the sediment around, so I don't encourage it. Rather, I drive my corkscrew worm directly into the bottle's cork, through the wax, and the wax comes away from the top as the cork is extracted. The only time you don't want to do this is when you might be dealing with a half-cork stopper, like in the case of certain Cognacs, for instance. In those instances there is no driven cork, for the corkscrew worm to meet when it goes in the bottle top. There are broadly speaking, two kinds of wax that you will encounter, the hard flaky kind and the soft, pliable kind. If you want to remove the soft kind from the bottle neck side (to prevent pouring liquid over it), you can run your corkscrew lever up and down the side of the bottle, creating two long groves in the wax. You will find it easier to remove the soft kind of wax from the bottle if you then start pulling from where the grooves are. Joe - Aged wine often seems like a fetish for people. People associate quality with ageability. They immediately want to know how long a wine can age, and the longer the better. Not all wines benefit from aging; and not all people enjoy mature flavors in wine. There’s something to be said for drinking wine in its sprightly youth. Don’t get me wrong, I really enjoy old wine, but I often worry that people are lead astray by thinking that older is better. Like people, there’s more that can go wrong with wine as it ages. Peter - Always have a good alterations tailor. Don't use Microsoft products. Never trust a guy who doesn't look you in the eye when he's shaking your hand. 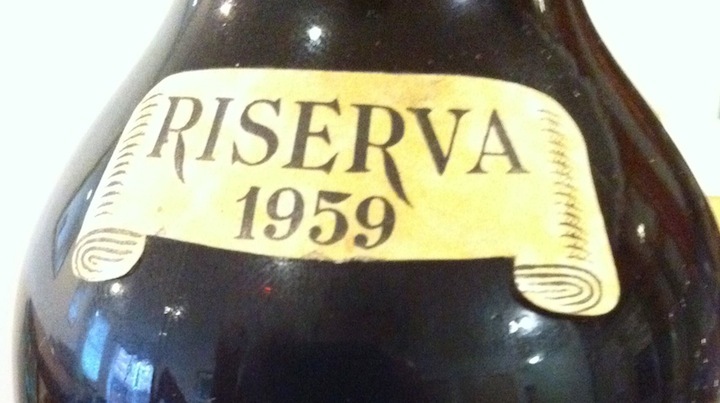 By the way, I should have asked these guys before drinking my 1959 Barbaresco. I did not decant, but opened the wine at noon on the day I would serve it at about 9 in the evening. I used a double pull corkscrew, but the cork broke in half. When I tried to get in there again with the corkscrew, I just pushed what remained of the cork into the bottle, and there it sat, broken and dusty, in my lovely old wine. I tasted it about every two hours until we drank it. 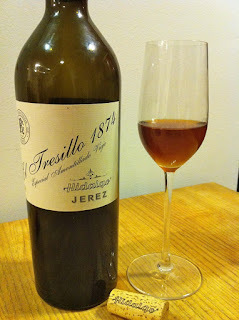 It was great to drink such an old wine, and it was very delicious, but not mind-blowing. In fact, one experienced taster suggested that it might have been better about 10 years ago.